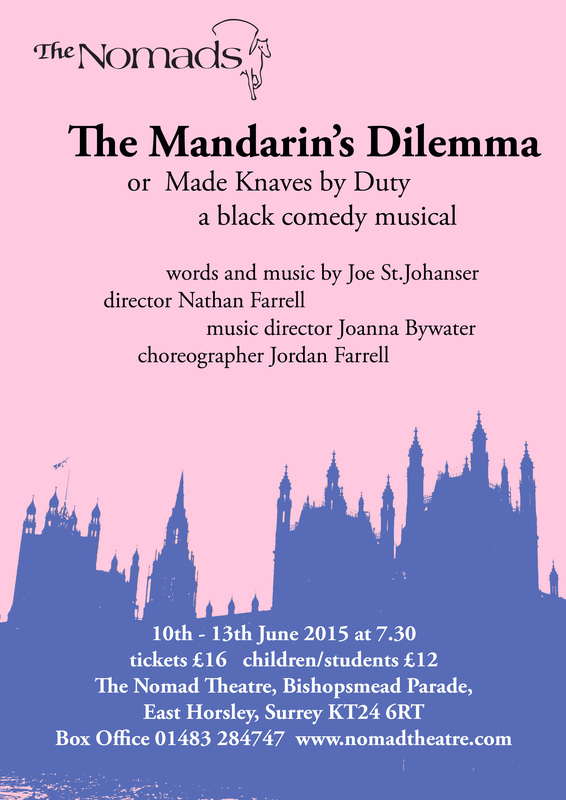 The sixth full-length stage work by composer and lyricist Joe St. Johanser, The Mandarin’s Dilemma, presents the story of an audacious plan to bring down the UK government coupled to an imminent nuclear threat posed by the dictator of the fictitious country Gondwana. Set on the eve of the General Election, it encompasses the machinations of various leading politicians and civil servants including the vampish Deputy Leader of the Opposition, Rumena Haaridan, the senior mandarins Sir Tristram Seville and Sir Norman Persimmon, and their younger counterpart, rising parliamentary star Helena Besty. Its premiere production at The Nomad Theatre, East Horsley benefited from excellent leads in Helen Semple as Besty and Anna Loveday as Haaridan, both of whom were highly convincing in their execution of their characters. Other principals delivered similarly assured performances, notably Peter Hart and Andrew Hamel-Cooke as two convivial mandarins, and Danilo Antonelli as the heavy-handed Prime Minister. Director Nathan Farrell successfully originated a robust vision of a challenging work, the only discernible indications of uncertainty being a slight sense of hesitancy in some of the chorus numbers. Nonetheless, individual cast members shone in many commendable supporting roles, not least Nick Gee’s authoritative turn as the army commander-in-chief and Rachael Ball’s as his spirited aide. The score of The Mandarin’s Dilemma creatively employs the constituent members of the nine-piece classical ensemble in an endless number of different combinations with its frequent intermezzi. Much of the music was conceived in terms of individual lines, often with a distinctly modal flavour, while the opening of Act II particularly exemplified the minimalist influences the composer acknowledges he had absorbed from Michael Nyman. As musical director, Joanna Bywater admirably navigated its inherent complexity and the relative dearth of obvious points of formal articulation or clear refrains beyond the ensemble numbers, and for the most part provided an effective yet unobtrusive underscore. The cast were evidently undeterred by the intricacy of the plot, even notwithstanding a few moments at which it felt contrived or unbalanced. One scene sees Besty take to the catwalk at a fashion show because, somewhat implausibly, this is supposedly the only way she can have a private conversation with Haaridan. Another involved an elaborate song and dance number performed by a TV crew, by way of introduction to a hard-hitting political interview that was strikingly brief in comparison. The plan set in motion during Act II is the brainchild of Besty’s boyfriend, the PM’s scriptwriter Bernard Haplesser, who is conspicuously absent throughout. Perhaps this was all intentional, but it was a pity given the strength of Mark Bassett’s performance in the role of Haplesser. Overall, this production represented a musical stage work on a quest to establish its own identity. The comedic aspects could have been brought out much more strongly had the interpretation of the piece been less serious – after all, the collapse of the British government and the threat of nuclear war are not matters over which an audience would necessarily wish to laugh. Likewise, the precise nature of the titular mandarin’s dilemma did not come across as clearly as it might, possibly because the crucial exposition was presented as a trio in which the two older civil servants repeated the heroine’s words in a routine that became rhetorical after a while. 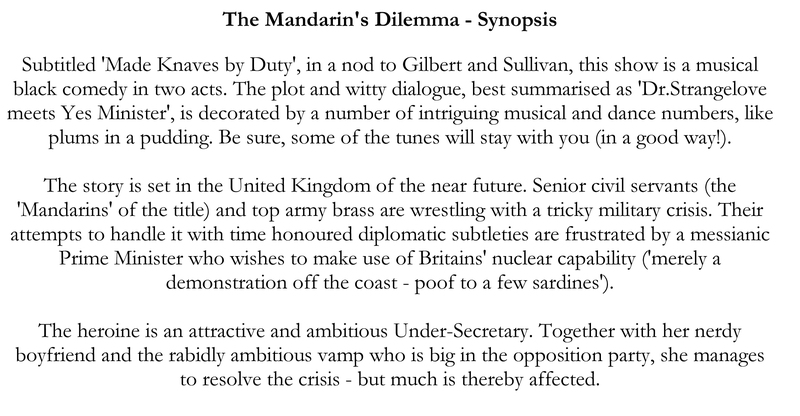 In his programme notes, St. Johanser asks where The Mandarin’s Dilemma may be positioned in terms of genre. Leaving aside the classical influences of the music and the manner of its scoring, the interpretation taken by this production perceptibly leaned towards the operatic, with several principals evidently drawing on a blend of classical music college training and previous opera credits. The result was a performance that suggested more the profundity of a chamber opera than the light-heartedness of operetta or the easy listening of musical theatre. Perhaps this is unsurprising given that the composer already has five operas to his name. It is rare for a reviewer to read programme notes from both Director and Composer but this is what confronted me when I arrived to see the opening night of an entirely new composition—the first ever performance of Joe St. Johanser’s ‘The Mandarin’s Dilemma’. Described as “a black comedy musical”, my own feeling is that this was an opera rather than a musical or even an operetta– and none the worse for that. I have little doubt that the title led some audience members to anticipate a rehash of The Mikado, but how wrong we were. Here was a splendid cross between “Yes, Prime Minister”, and one of Steve Thompson’s political comedies as written by Rossini or Verdi. I don’t remember, however, a scene in the television series in which Jim Hacker was seduced in front of the camera! Lovers of the work of Benjamin Britten will, doubtless, have appreciated the quality of the music played by the nine-piece Constanza Consort, occupying a prominent upstage position throughout and conducted with élan by Joanna Bywater who was also Musical Director of the whole show. Did I also catch a touch of Kurt Weill? A musician in the audience detected the influence of Stravinsky as well, but make no mistake, the music was entirely original and demonstrated the mastery of the writer of both book and music. Even a non-musical reviewer could not fail to be entranced by the superb singing of the entire cast—soloists and chorus and their pin-point exactitude and clarity –. No need for radio microphones for these performers—the projection and resonance filled the theatre to the back row and the diction was perfect throughout; every sung word was audible although, sadly, this was not always the case with the spoken word. Rather than a conventional overture we were treated to a remarkable video of drifting clouds as General Sir Jock Saddleup, Commander of the British Army (Nick Gee—a big man with a very powerful voice) is hurriedly recalled from the USA in face of a threat to the Empire by the renegade country of Gondwana compounded by the discovery that the terrorist state has planted ‘dirty’ atomic devices intended to decimate the capital’s population. His lightning air dash continues on the pillion of a motor bicycle accompanied by his aide, Captain Jill Bobbit (an excellent and feisty Rachael Ball) through the streets of London to emergency discussions with the British government and its beleaguered Prime Minister, Gordon Blackead ( a permanently worried Danilo Antonelli), who somehow bears an uncanny resemblance to a recent Prime Minster in real life. He is facing re-election and desperately planning retaliation. In the present House of Commons senior civil servants, Tristram Seville (Peter Hart) and Norman Persimmon (Andrew Hamel Cooke), real Humphrey Applebys both, are attempting to rein back the PM’s threatened aggressive measures against the rebel state. Sir Tristram, conspires with his ambitious assistant. Helena Besty (a superb Helen Semple with a remarkable voice), with help from her boyfriend, Bernard Haplesser, hapless by name as well as nature (Mark Bassett again singing beautifully) to defeat his plans, In retaliation Blackead enlists the support of the leader of the opposition, the towering figure of Rumeena Harridan (Anna Loveday, setting a commanding presence and voice) to support his aggressive policy. Meanwhile the ubiquitous Cleaning Lady (Annabelle Farrell) roams around with a camera concealed in her bucket- is she a spy or an investigative journalist? The plotters, Helena and Bernard arrange to corner Rumeena at a Parliamentary Fashion Show, providing an amusing and colourful interlude in the proceedings. As a result of these shady dealings, Rumeena seduces the Prime Minister for purposes of blackmail. Rowdy scenes in the House with members nearly resorting to blows were quite hilarious and culminated in a well produced TV interview although I felt that Moyra Brookes (the Speaker), Elaine Burns (leader of the Opposition) and Cindy Agnew (the TV journalist) were given little opportunity to shine. In the war room Captain Bobbit is all for an immediate attack on Gondwana and reports of the battlefield are relayed back to the House, assisted by more excellent videos. But finally, while the senior mandarins enjoy a final night at the opera, typically ignoring the country's increasingly desperate situation, the storm breaks. What an excellent production ‘Mandarin’ was. Solos and ensemble work were nearly flawless, the Chorus playing a major part in the success. This musical deserves to be staged again in other theatres. Criticisms are really minor. While the overall direction by Nathan Farrell was pretty good, a continual difficulty was that, with conductor and orchestra up stage, the Chorus needed to be careful that their combined movements were orchestrated so that they did not lose sight of the conductor; this problem occasionally presented itself to soloists as well. Secondly, the cleverly constructed but too heavy, trucks carrying the scenery were difficult for an enthusiastic and efficient stage crew, led by Stage Manager, Jennifer Bye, to shift during set changes—doubtless these will become more slick during the run. Choreographer, Jordan Farrell made the most of the comic possibilities particularly in the madcap House of Commons riotous assemblies, but a few more spots of real humour would have helped the show along. Costumes, and so many of them, by Jenny Hasted and Jackie Shearer, were immaculate, lighting (Tony and Dee Bowdery), sound (Clive Vinall)—all were impeccable. And I did appreciate a well produced and very informative Programme. The final House of Commons tableau, frozen behind a gauze, was eerily reminiscent of a Hogarth painting. This is an ambitious show for any Company to mount and it is hugely to the credit of the Nomad Theatre that it should succeed so admirably. Unusually for a musical there will be no "audio enhancement". Actors, singers and orchestra will be performing without microphones and without loudspeakers - no earplugs will be needed and the full beauty of the voices and instruments can be appreciated in this intimate theatre.